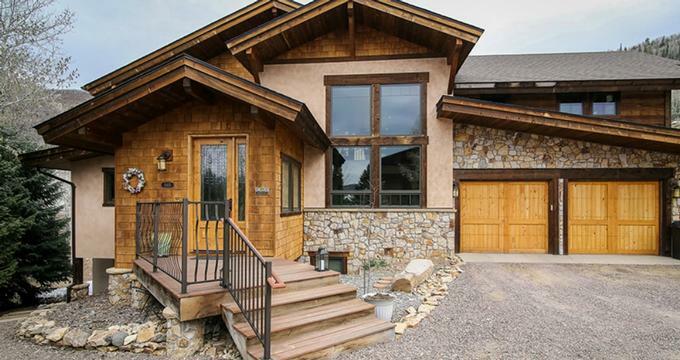 Located in Steamboat Springs in Colorado, Chalet Val d'Isere is a warm and welcoming traditional mountain home that offers a relaxing mountain getaway. Set high on the mountain in a small cove and surrounded by the breathtaking natural scenery of the Rocky Mountains, Chalet Val d'Isere features two well-appointed guest rooms with private bathrooms and stunning valley views. Boasting a casually elegant interior with warm maple wood floors, luxurious oriental rugs, a welcoming lounge with a crackling fireplace, and a collection of eclectic valuables, the charming bed and breakfast is the perfect place for unwinding after a day of outdoor activities. The Inn has an upstairs games room with a pool table and flat screen television and great views, and drinks and snacks such as coffee, tea, and sparkling water are available all day. Situated in Steamboat Springs, Chalet Val d'Isere is an ideal base for adventurers and outdoor sport-lovers who can enjoy an array of sports throughout the year, including hiking, mountain biking, climbing, fishing, skiing, snowboarding, snowmobiling, and cross-country skiing. Chalet Val d'Isere has two cozy and comfortable guest rooms on the first and second floor of the Inn with plush décor and mountain cottage-style furnishings, tiled marble floors, private bathrooms with walk-in showers and soaking tubs, hairdryers, plush towels and organic bath products, and modern amenities. The Apres Ski Room is located on the main floor of the Inn and features a queen-size bed with deluxe linens and down duvets, an en-suite bathroom with a deep soaking tub and a walk-in shower, and stunning views of the surrounding forests. The Alpenglow Room is found on the second floor of the room and features a king-size bed with plush linens and down duvet, a large private bathroom with a walk-in shower, four large windows that flood the room with natural light and embrace beautiful views. Modern amenities in each room include flat-screen cable TVs with satellite channels, hairdryers, and complimentary wireless Internet. A hearty continental breakfast is served in the cozy dining room every morning and includes fresh fruit juice and fruit, hot and cold cereals, yogurt, freshly baked bread and pastries, egg and meat dishes and signature treats, along with coffee, tea, and other hot beverages. Amenities at the Chalet Val d'Isere include a welcoming lounge with a crackling fireplace, an upstairs games room with a pool table and flat screen television and great views. The Inn has a children’s playground, an outdoor hot tub, a luggage storage service, an exclusive spa, and wellness center where guests can enjoy indulgent and pampering massages, body treatments, and other spa services. A hearty continental breakfast is served in the cozy dining room every morning, and drinks and snacks such as coffee, tea, and sparkling water are served all day. Guests can enjoy packed lunches for days out, and there is complimentary wireless Internet around the property. Situated in Steamboat Springs, Chalet Val d'Isere is an ideal base for adventurers and outdoor sport-lovers who can enjoy an array of sports throughout the year, including hiking, mountain biking, climbing, fishing, skiing, snowboarding, snowmobiling, and cross-country skiing. Other attractions in the area include the historic 1909 railroad station known as The Depot, the Steamboat Springs Art Museum, the Tread of Pioneers Museum, the Main Street Farmer’s Market, the Yampa River Core Trail, and the Yampa River Botanic Park.